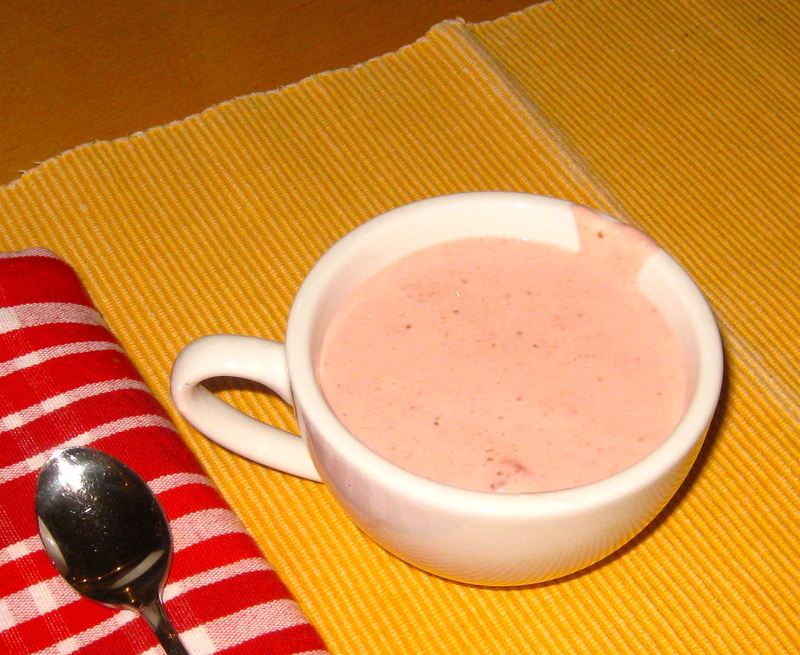 I almost called this strawberry soup, but somehow soup doesn’t sound as appetizing as mousse. Also C, from whom I got this recipe, calls it mousse, too, so I decided to stick to the dish’s roots in naming my version. In any case, this “mousse” is an entirely delicious springy-summery dessert. C made it for us when we were in Brussels with my parents last month, and F — not known for his sweet tooth — easily slurped down two servings. Seeing as F’s birthday was this week, and remembering how much he loved C’s strawberry mousse, I had the brilliant idea to surprise him by making it myself. He certainly was surprised and loved the mousse as much as he did in Belgium. I believe “this is awesome” was repeated quite a few times as he was consuming it. Despite being a dessert, this mousse isn’t entirely unhealthy. Sure, there’s some double cream and sugar, but not that much in relation to the volume produced. Yogurt lends a nice tang at the finish, and lemon juice brightens everything up. C had told us that her mother — from whom the original recipe comes — adamantly said not to whip the cream first. I whipped it, just to add a bit more body to the mousse; it is still soup-like but in the best way possible. I also stirred in some diced strawberries for chew-factor. Stir the yogurt into the strawberry puree. In a separate bowl, whip the cream and sugar together until soft-medium peaks form. Fold into the strawberry mixture. 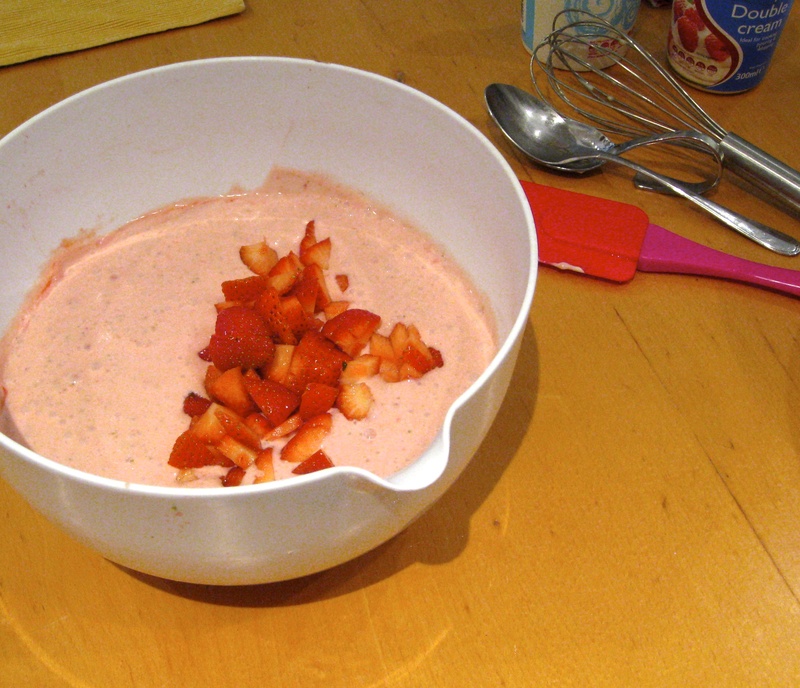 Dice the remaining strawberries and stir them into the mousse. Refrigerate for at least 4 hours and serve chilled, preferably on a warm spring or summer evening. This entry was posted in celebrations/holidays, family, food, health, pictures, recipes, travel on 15.06.2013 by taplatt. Yum! This one looks really good : ) A great summer dish. Strawberries are everywhere nowadays in Ukraine, people are carrying them around by the bucketful… as you probably remember! Yes, Katherine, I do remember the tasty Ukrainian strawberries. This mousse would be a great way to use them up!